Team or Organisation; which to support and what Organisations can do about it. With Season 5 just started and the first games of the LCS 2015 Spring Split now underway, we can at last say that the 2014 off-season has finally drawn to a close. This is the time that, theoretically, players can rest and take time off. With Season 5 just started and the first games of the LCS 2015 Spring Split now underway, we can at last say that the 2014 off-season has finally drawn to a close. This is the time that, theoretically, players can rest and take time off. However, it’s also when teams sort their rosters for the forthcoming Season and can be a crazy, crazy time. Loved players are cast aside, unknown faces emerge from Challenger, or re-emerge from Riot’s ban list, and many teams change almost beyond recognition. Perhaps the biggest and most spectacular changes occurred within one of League’s most dominant teams in the EU; Fnatic. First, amidst countless rumours and gossip, they lost their prize ADC, Rekkles to their main rival Elements. Then, following further rumours, they lost their jewel-in-the crown mid-laner xPeke who departed to form his own team Origen, along with their longstanding jungler Cyanide who decided to retire. This left Fnatic with their toplaner, sOAZ and support, Yellowstar. 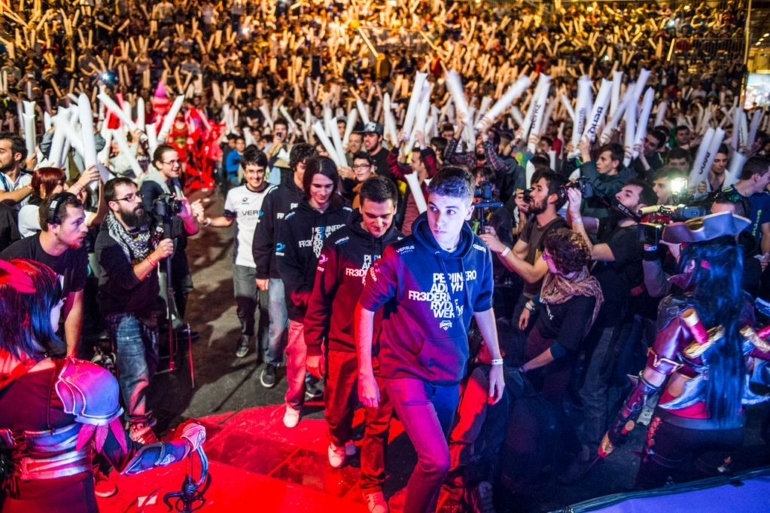 Finally, as a final coup de grace, sOAZ too left, to join xPeke in Origen. This posed the following for your general Fnatic supporter; was Fnatic a team that they still wanted to follow? Fnatic had lost 4/5 players it started out with in Season 4. XPeke, Cyanide and sOAZ had all been with Fnatic since practically the start. The team was completely different. However the team Fnatic, was also part of Fnatic the e-sports organisation. If the team changed but the Organisation remained, what did that mean? Should support of the team overide the support for the Organisation and should this be overidden in turn by support for the players. In mainstream sports, people support teams without much question; Manchester United, London Irish or the Washington Redskins, and there isn’t the same separation between a team and their Organisation. People don’t stop supporting a team because they change a player. But in e-sports, support for teams is often very player-led. It’s said that this demonstrates the immaturity of the e-sports scene but this is arguable in my opinion. In mainstream sport, supporters will often support a team because of a link, perhaps geographical, or a family connection. In League some teams have tried to build a national identity, Giants; a League team new to EU LCS, is Spanish, C9 is seen as being 100% NA and up until now ROCCAT had a strong Polish identity. ROCCAT originally picked up a newly qualified Polish team back at the start of Season 4 and it looked like they’d be trying to maintain this Polish link. However, ROCCAT demonstrates the difficulty of this approach. For them to aim for the top, there are simply not sufficient Polish players of the desired calibre. They are now fielding a Danish player as their mid-laner and are deliberately moving to become an English-speaking team to facilitate his integration, as well as more international additions in the future. Establishing a national identity in this way is not possible for most teams. There is also another issue with e-sports teams; they’re small. Change three players in a football team, not so noticeable, change three in a League team roster, that’s over half the squad gone and the team is suddenly very different. Why should the average supporter stick with them? So what should a team do, or more to the point, what should an Organisation with an e-sports team do to maintain a constant fan base through these shifts? There will always be supporters who simply move from team to team depending on success but what about maintaining core, more long-term, support? Returning to Fnatic, many had adopted the team because of the players, the front men. I was one of them, new to League as an e-sport in Season 4. Fnatic as an Organisation was just a brand that they played under, a logo. There was little sign of any management or a Manager to identify with, they’d had a Coach who was, but he left after Worlds. The result; when the players left, much of the support left with them. The fact that amongst the supporters who remained, many did so only because of Yellowstar, who now after the team’s success in the first week is being trumpeted as the saviour of Fnatic, doesn’t assist since there are rumours that he may be retiring relatively soon. From this, it’s interesting to follow sOAZ and XPeke from Fnatic, to look at xPeke’s new team/organisation that he’s formed, Origen. Origen is very much branded with the identity of xPeke. The idea is that he will continue to play in the team until he retires and then continue running Origen as Owner/Manager. XPeke as a brand is strong, he is a very popular player with a wide reach. He has already attracted a large supporter-base in his own right and brought over a significant proportion from Fnatic. If played correctly, Origen will be able to maintain this, above and beyond any individual roster of players, simply because of the continuing involvement of xPeke. There are precedents. The creator/owner of NA team CLG, now an e-sports organisation, is Hotshot, an ex-player who streams and has a very high profile and providing continuity for supporters as rosters change. Similarly TSM, also NA, was formed by Regi and TheOddOne who were players before moving into coaching for the team, alongside a Management role for Regi. Is it coincidence that both these teams seem to have a large and fairly constant following that has been retained through many ups and downs and roster changes and gives the appearance of being more brand rather than player based? Returning to ROCCAT, their Manager, Flyy, is appearing on various League talkshows and is managing to establish a very strong identity separate from his team. I’ve no idea if this is intentional but a possible outcome could be the retaining of current ROCCAT supporters through future roster changes simply because Flyy is a ‘cool guy’ , supporters want to see what he does with ‘his team’ and they want to see him succeed. This might start to happen more frequently. Riot is now funding teams to have Coaches and is allowing them on-stage giving them greater visibility. Generally there is an increasing emphasis on organisational infrastructure and support staff. Teams will start to be increasingly identifiable beyond just the players and Organisations will start to take on a more human face. It may be that teams and organisations are starting to realise that having constantly changing rosters and players that rapidly come and go, particularly as the competitive lifetime of a player is generally 2 to 3 years tops, does not lend itself to a stable scene from the perspective of retaining supporters and, looking to the longer term, perhaps maintaining League’s popularity. Raising the profiles of more permanent staff can only help with this as well as keeping ex-players as streamers, analysts etc.